Frédéric Sanchez was born in 1960 and graduated from HEC Business School (1983), as well as Sciences-Po Paris (1985). He also holds a Master Degree in Economics from Université Paris-Dauphine (1984). He started his career in 1985 with Renault in Mexico, then in the USA. In 1987, he became a Mission Manager at Ernst & Young. 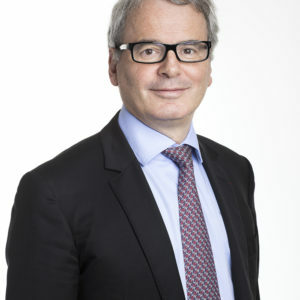 In 1990 he joined Fives-Lille group, in which he held various positions before being appointed Chief Financial officer in 1994 and becoming Chief Executive Officer in 1997. In 2002, the « Compagnie de Fives-Lille » (renamed Fives in 2007) became a company with a Management and Supervisory Board, chaired by Frédéric Sanchez. Under his leadership, Fives accelerated its development by re-organizing into four divisions and strengthening its geographical footprint through major acquisitions and the opening of regional offices in Asia, Russia, Latin America and the Middle-East. Since 2002, Group sales more than doubled, as well as the number of employees.